LG’s been busy this year at MWC, launching four affordable new smartphones as well as two new smartwatches. We got hold of all the new phones – LG Magna, LG Spirit, LG Leon and LG Joy – to give you a first look at what they’re all about. The LG Magna and Spirit are the biggest and best of the new phones with curved 5 inch and 4.7 inch HD screens, respectively. Yep, LG has brought some of the state of the art curvy technology that you’ll find on the LG G Flex 2 to much more affordable phones. But the LG Magna and Spirit use a standard LCD screen, not the Flex 2’s Plastic OLED one, so they curve much less. Away from the striking design created by the curved screens, the LG Magna and Spirit are decent mid-range smartphones. They both have speedy 1.2GHz quad core processors and 1GB RAM, so they’ll happily run your favourite apps and games, 8 megapixel cameras for sharp photos and big batteries that’ll keep you going all day. The LG Leon and Joy are a step down from the other two phones and don’t have the same curved screen, although the design is very similar otherwise. The Leon has a 4.5 inch screen and the Joy has a 4 inch one, making them great for those of us who don’t want massive phones. Inside, you’ll get the same 1.2GHz quad core processor and 1GB RAM that you’d get in the bigger phones, so they’ll be just as fast. And round the back you’ll find 5MP cameras. Unlike some budget phones out there, the LG Leon and Joy still have front cameras for video calls. 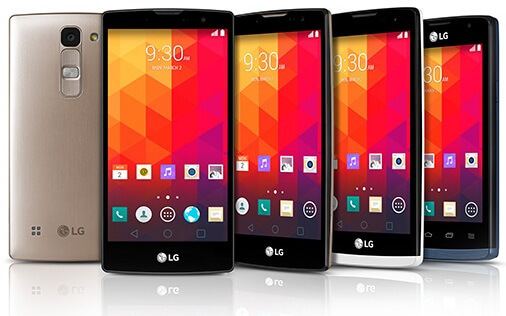 LG has said that the four new phones will go on sale in the coming months and should cost under USD$250. Which one would you go for, LG Magna, LG Spirit, LG Leon or LG Joy? Tell us in the comments below.